Well in a manner of speaking. After over a month working with Speakeasy, two Covad visits and work by Verizon, I gave up. So I am with a new DSL provider that is very local and so far (one day and counting) it is working great. The plus side is I save approximately $40 per month for the same connection speed. Very very neat, check out the video on YouTube. This Stone Golem was constructed using about 5 foam mattresses, over 50 sticks of hot melt glue, and 8 cans of grey and black spray paint. The foam is glued in large thick sheets (approx 20cm thick) to a fabric bodysuit, and the deep cracks are carved into the foam surface. The bodysuit has a zip up the back to allow the wearer to enter it, and the zip is concealed by abutting foam. The soles of the feet are made of corflute that has been sliced in half to expose corrugations that act as grip. The arms are about twice the length of the wearer's arms, and act as swinging weapons made entirely of soft foam. The golem took about 100 hours of work to construct, between 3 people. On its first appearance, the Stone Golem sent twenty bold adventurers into a hasty retreat without so much as touching them. I have knitted - then frogged the Jaywalker sock two times now. So I have decided that it may not be for me to knit. The first time I decided to change my double decrease after doing about 3 inches of the sock body, the second time it was way way too tight. This is the Red Cross "Knit your Bit" kit. 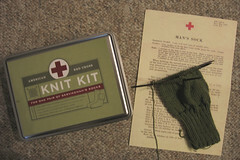 It comes with the olive drab wool yarn, knitting needles (not the ones in the picture) and a darning needle as well as a copy of the WWII Red Cross Sock Pattern.